I call these levers “Coneheads”. They are the new hydraulic brake/cable shift integrated levers for SRAM’s Red group, and the elongated horn atop the lever presumedly houses the hydraulic master cylinder. CG spy shots of the levers and calipers leaked out way back in spring, but the hardware didn’t show up at SRAM’s Interbike booth in September. They did show up last weekend at USGP#3 on the Cannondale-Cyclocrossworld team bike belonging to team leader Tim Johnson. After testing the set-up in practice, Johnson chose to use the more familiar standard Red levers pulling on BB7 cable-discs. These are the clearest shots of the actual levers that I’ve seen so far. Velonews’ tech writer Lennard Zinn got chased out of the Cannondale-Cyclocrossworld team bus without getting nearly as good a shot. They look like they are at least pre-production versions since they have the Red graphics on the lever blade and the rubber hood has moulded-in logos, but still SRAM has not hinted at when they will make an official introduction. Rumour in the industry is that they should have been shipping OEM on bikes by now. 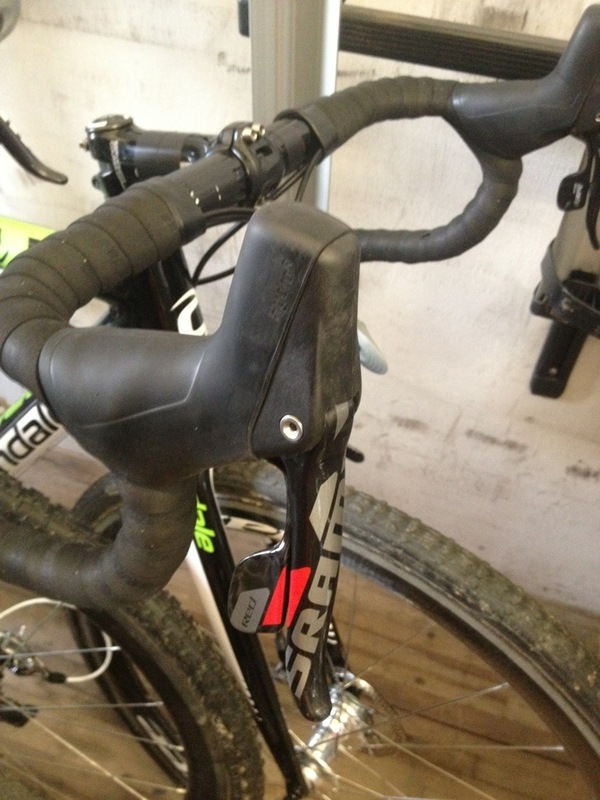 Will these levers herald the hydraulic brake roadbike revolution? Well, we’re still waiting for the trumpet to sound……..